Watch the video in the link for more details. 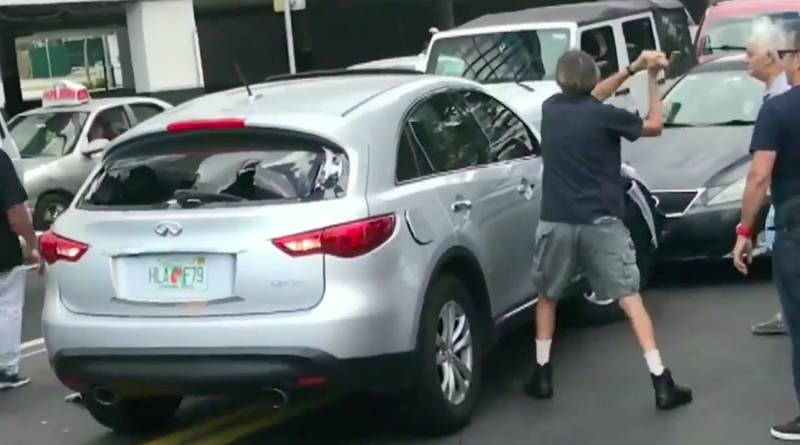 An Infiniti QX70 driver in Miami crashed into a bunch of cars, and then apparently tried to escape. But a group of angry citizens ran him down, and wrecked his already-crashed SUV, with one guy using a sledgehammer to inflict the karmic, vigilante justice. After the driver puts the SUV—whose front fascia is dangling from the crash— into reverse, and tries heading down a side street, a number of people begin banging on the car, trying to get the driver to stop. One guy breaks the passenger-side door handle off, and another appears to shove a pistol into his pocket as he approaches the car. Hammer dude lucky driver didnt have a gun. could have shot him and pleaded self defense easily. This entry very closely matched one of my dad's driving experiences in Italy about 35 years ago (not the hungover part). Unplanned road trip from Venice to Pisa, 2005. I wake up, super hungover, and realize I’m going to miss the train from Venice to Pisa to catch my plane back to the UK where I lived at the time. Long story short, it made more sense to rent a car and drive to Pisa than changing everything else around. So I find the rental car company nearest my hotel in downtown Venice and pay €360 for the privilege of driving 200 miles in a Renault Clio. And not one of the fun Clios. A Fleet Clio. So I’m on the A13 en route to Pisa and I go to pass a truck in my Fleet Clio, which is not exactly a monster between 50 and 70, and next thing I know there is a lunatic in a grey Volvo 850R wagon an inch off my bumper blaring his horn and flashing his lights. I get around the truck as fast as I can and immediately get right to allow this guy to pass. He gets in right behind me and continues blaring his horn and flashing his lights. Then he takes off, gets right in front of me and brake checks me hard, still blaring his goddamn horn. THEN he falls back alongside me and starts yelling at me through his open window, STILL BLARING THE HORN. It is summer in Italy and my Fleet Clio has no AC, so my window is also open. I have no idea what he’s saying, so the only thing I can think to do is scream “Sorry! I’m not from here!” as loud as I possibly can. The guy hears me, his face completely changes, he starts laughing, and he takes off. I doubt he understood what I said, but all it took was hearing my English for him to realize that I was just an idiot foreigner and that he could cut me some slack. The lesson here is always double check your side mirror before passing in an underpowered French econobox while in Italy. Mob mentality is so much fun. You would think taking a cellphone picture of the plate would have been enough. Plate AND Driver. To avoid the "Hey my car was stolen and I think the dude crashed it". Story needs a Florida Man headline, even if the driver is female. Wow, a community where people don't live on safe place pedestals and actually try to help their fellow man. How about those Infinity windows, huh? Impressive! They are obviously shaded, so maybe not the standard glass, bulletproof even? Higher end cars tend to have windows that are tough to break. A friend locked his keys in his BMW, late at night, while a long way from home. He couldn't track down a locksmith. He found a hammer and decided to break a window to get in. No matter what he tried, he could break a side window. He then tried a cinder block. It still didn't work. He waited until morning and found a locksmith who said there was no way he was going to break the window that way. A center punch would do it, but not much else. A center punch would do it, but not much else. LOVE spring-loaded center punches. Some batons have a metal button on the bottom to help break windows, but aren't approved by a lot of police departments. 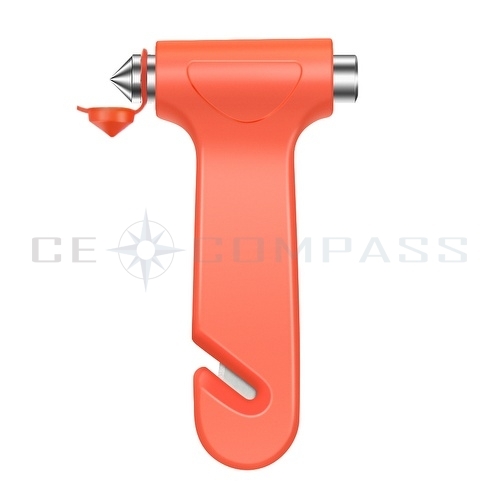 A spring-loaded punch is easily carried. The glass is shattered but almost all of it stays in the frame. Then it's easily knocked out by a gloved hand. No flying bits to cut or get into anyone's eyes. ...and actually try to help their fellow man. It's a property crime. The article noted no injuries. ID the driver, get a plate. There was no need to risk injury to anybody, vigilantes or suspect. Exactly. It would have been a tragedy for Hammed Dude to die needlessly over what started out as a property crime. Pistol Dude showed some common sense in putting the gun away. That could have been tragic as well. Heh! Sounds like my brother! I sold him an old Plymouth police cruiser I bought for transportation after totaling out my daily driver a few years earlier. It was a tank, but only got something like 9 miles to the gallon, so I finally replaced the cruiser and sold it to my bro. He stopped at a party store one night and locked his keys inside while the car was running. He asked the clerk for a hammer, as his first thought was to break out the window. He couldn't understand why the hammer only bounced off the glass, no matter how hard he tried to break it. A big part of that, besides a larger impact area more easily dissipating the energy across the glass, is the window moulding absorbing some of that energy. Place that glass on some bricks and it's a different story. The lesson here is always double check your side mirror before passing in an underpowered French econobox while in Italy. Yep. I had a Fiat 500 in Italy. You had to make sure there was nobody approaching. The "500" stood for the number of seconds it took to pass.